The most successful and record holder great film hero in Pakistani film history. He struggled many years from 1956 to 1970 and got breakthrough from film Babul in 1971. 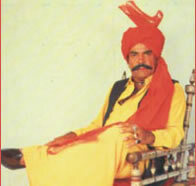 Basheera (1972), Wehshi Jatt (1975), Moula Jatt (1979), Sher Khan (1981) and many other superhit films made him a demand of box office. He was dominating hero in more than two decades and undefeated super star till his death. He was killed by an un-known gunman on January 9, 1996. 428 1993 Khuda Gawah P/U Neeli, Sultan Rahi, Saima, Yousuf, Nadeem, Javed SH. » The Sultan Pleco (L264)..